Fans of the gardens and woodland in and around Portmeirion may want to pick up the latest issue of "Country Homes and Interiors" Magazine. Within it, gardener and "Portmeirion" co-author Stephen Lacey talks about his "favourite view", and a piece from Lacey's chapter from the "Portmeirion" book (available from Portmeirion itself for £19.99) is reproduced. 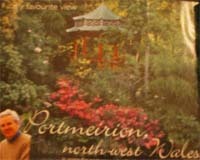 Portmeirion is also mentioned in the February/March 2007 issue of "In Britain" magazine, in an article about Snowdonia. The author of the piece Jackie Newey, however, doesn't appear to have visited since the 1980s, stating; "I discovered early that the peacocks are good for sketching as they strut and pose for hours." Thanks to Jill Mills and Cathy Frumerman for this news item.